The ‘Export’ management screen allows all CSV/Excel exports in GatorMail to now be centrally available and managed. For detailed help information on the export centre, please see main help article here, as this relates to GDPR help. Export and forget: no need to wait while the export completes, you can now carry working in the application and you will receive an in app notification and email to say when the export has completed. 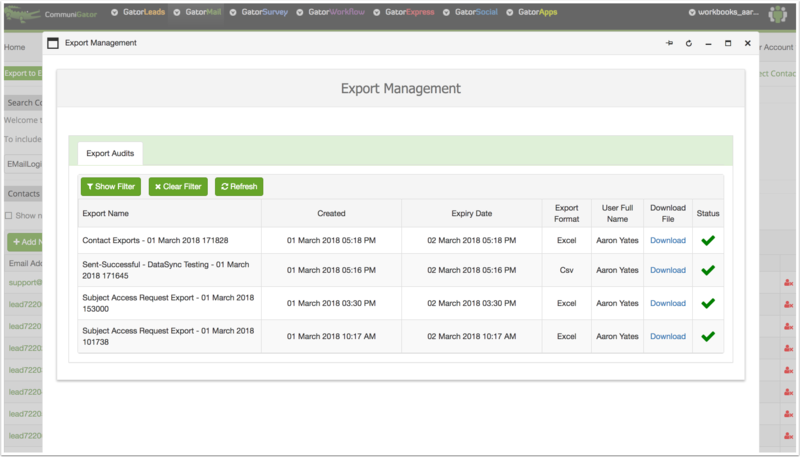 Then go to the export management interface and have access to the completed CSV or Excel file. Audit: all exports are audited so a history is available or all downloads of data in your system. So when exporting data from campaign audience, campaigns results, contacts, etc etc through out the system then you will see the following likely actions that will drive you back to the export centre. All the exports are stored for 7 days. Only admin users can access unless admin gives you approval by receiving notification or any user can be set up with the role to access exports. Prev: My CSV file isn't uploading!